The Sweeneys are 100% a YouTube family. We just can’t seem to get enough of it. From Liam checking out Minecraft videos to Bill learning some basic plumbing and electrical work to Natalie checking out craft and crazy challenge videos to my being a member of the YouTube Parent Panel to Caleb loving YouTube Kids, the online video mega site is pretty much a staple. Out of all that YouTube has to offer, the YouTube Kids app has to be my absolute favorite (check out my playlist here). It’s just so user-friendly and fun, plus it does an amazing job of bringing all the awesome, family and kid friendly content YouTube has to my little guys. Caleb really is hooked (it could be a problem…LOL). It seems like I’m not the only one loving on the Kids app either! It’s been a busy few months forYouTube Kids (download the app at Google Play and App Store). In February, the app was released, designed especially for kids, to bring to life the best family-friendly content on YouTube. Since then, families have downloaded YouTube Kids more than 8 million times, consistently ranked YouTube Kids in the top 5 kids apps in the App Store, given an overall 4+ rating on Android and watched Stampy cat explore the world of Minecraft more than 54 million times. Watch YouTube Kids on the big screen: Want to watch YouTube Kids on the big screen and enjoy your favorite videos as a family? 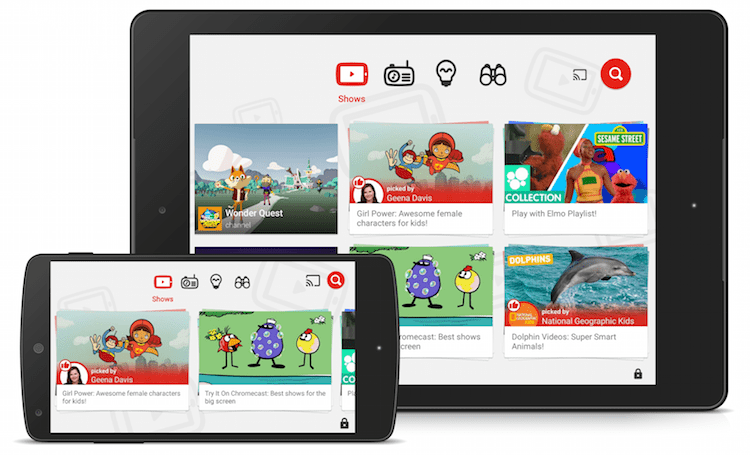 Now YouTube Kids is available on your TV, using Chromecast, Apple TV, game consoles or a smartTV. This is awesome. It makes the experience so much more immersive and let’s the act of checking out the app become much more of a shared family experience! Explore new videos with guest-curated playlists: Have a budding scientist or eager explorer on your hands? Looking for some new suggestions of videos to watch? Find out what videos educators, celebs and other parents recommend with guest-created playlists. Playlists from National Geographic Kids, Kid President, and a girl power-themed playlist from Academy Award®-winning actor Geena Davis are already live—and more are coming soon from YouTube creators including VSauce and Amy Poehler’s Smart Girls. How can you beat that?? Enjoy new shows: New videos are produced and uploaded to YouTube Kids every day— including exciting original shows and series from HooplaKidz, TuTiTu,SciShow Kids, DreamWorksTV and more. Be honest, you’re kids will be telling you about all the cool new stuff and you’ll wonder why they know before you do. It’s ok, it happens to the best of us. Just sit back and enjoy. Learn how the app works: YouTube also wants to make it easier to get started using the app. When parents open YouTube Kids, they’ll explain upfront how their systems choose and recommend content and how to flag videos. The app will also prompt you to make a choice about how broadly you want your child to explore—turn search on to access millions of family-friendly videos, or turn search off to restrict your child’s experience to a more limited set. Either way, parents decide the right experience for their family from the get-go. This will roll out on the app in the coming weeks and I couldn’t be happier. The more control over the content my kids can watch, the better. No doubt about it. Customize your passcode: YouTube also heard some parents prefer a personal passcode, rather than a spelled-out code, so they’ve added this option to access parental controls. Again, the more control over the experience the better it is for me!! Plus, I only have a couple of passwords that I can remember anyway. LOL. As you explore YouTube’s library, from Twinkle Twinkle Little Star to learning about the solar system, the app is growing and improving with and because of you, the users. Always let them know how the app can better help your family explore, learn and sing along. While they always try to make the videos available in the app family-friendly, no system is perfect. If you ever find a video you’re concerned about, please flag it. This helps make YouTube Kids better for everyone. If you already love the app, I would love to know. Let me know who uses it and what they love most! If you don’t already use it, I would say give it a try and let me know what you think! It would be awesome to hear from you. Enjoy! Original article posted by Shimrit Ben-Yair, mother of two and YouTube Kids Group Product Manager, who recently enjoyed learning about Volcanoes on SciShow Kids and relaxing with Cosmic Kids Yoga’s Calming Playlist with her kids.